Dypsis sp tsaratananensis or Dypsis sp "White"
Dypsis tsaratananensis or Dypsis sp "White"
This species is NOT the true tsaratananensis but was probably given this name due to the locality in which it was collected..? 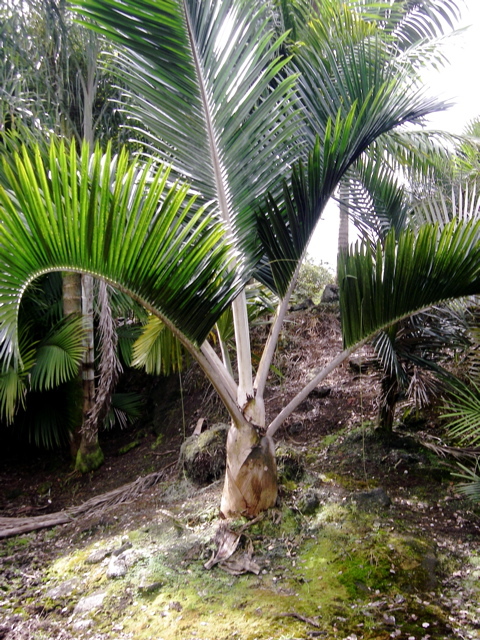 This species is very slow growing species especially in the subtropics, I would guess it is going to take over 20 years for this species to form a trunk for us in the subtropics, the photo above is of this species growing in Hawaii this palm must be around 17 years old now possibly a little older. At the moment it looks like this species is also an undescribed species so it has been called Dypsis sp "White" from the very white petioles this species has, more seed is now available of this species as it was first collected in the early 90's by an Australian collector named Mark Overend, and then not collected for many years after..! So we now have this species available again for those keen to give it a go i must say that this species has grown much faster in Thailand and in Indonesia as some of these are now quite large and do look like that they might soon begin to flower. We have seedlings available of this species now.